British Prime Minister Theresa May will be hoping it's third time lucky as she prepares to put her Brexit withdrawal deal to parliament before an EU leaders' summit on Thursday. In a newspaper editorial that comes 12 days before the legal Brexit deadline, May warned MPs that failure to support the plan may mean Britain will never leave the EU. Several scenarios are possible before EU leaders gather in Brussels. If May is successful – finally – in getting MPs to back her plan, the UK will ask Brussels for a short delay to Brexit that would secure a departure by the end of June. May herself says this isn't ideal – but it beats the shock of a no-deal Brexit on March 29, and it will allow Britain to get its house in order in time to deliver the departure from the EU that Britons voted for three years earlier. 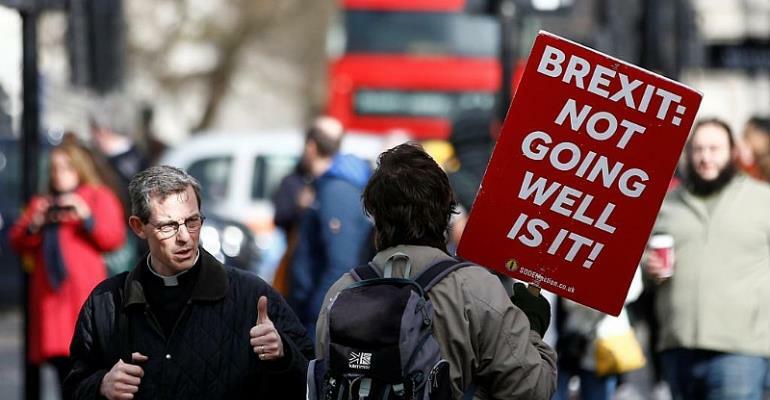 The real worry is that parliament will reject May's Brexit deal, forcing her to seek a longer-term extension to Brexit that would oblige the UK to participate in elections to the European parliament in May. People on both sides of the political divide say this would be farcical, with May herself warning it would be a "potent symbol of parliament's collective political failure". Of course it should be pointed out that the UK does not have the power to unilaterally delay Brexit itself. Such a move would need to be unanimously approved by the EU's remaining 27 member states . So far the EU has indicated it's ready to grant the UK an extension on Brexit – if London puts forward a convincing reason as to why it's merited. A source at the Elysée Palace cited by French daily Le Monde says France feels the solution to the stalemate “can only be found in London”. Chief EU Brexit negotiator Michel Barnier echoed that sentiment, saying Brussels had done everything possible for Brexit. The EU Commission president Jean Claude Junker earlier warned the UK that it must depart the EU before the European elections – or else take part. Indeed, most commentators east of the channel say the UK will be required to present a clear way forward to what happens after June if they hope to guarantee a longer-term extention to Brexit. Not only would it mean participating in the European elections, it would also mean promising a new event of the political horizon that would end the impasse – such as second Brexit referendum, or general elections.